Electric traction is an environmental friendly, pollution-free and energy efficient mode of transport and offers an excellent alternative to fossil fuels as a source of energy. Electric traction reduced nation’s dependence on largely imported diesel oil as it is capable of using indigenously available alternative sources of primary energies, like coal of any grade, hydel power, surplus petroleum gas, nuclear power etc. You can also Subscribe to FINAL YEAR PROJECT'S by Email for more such projects and seminar. Above image shows the project pantograph receiver circuit. Pantographs are typically operated by compressed air from the vehicle's braking system, either to raise the unit and hold it against the conductor or, when springs are used to affect the extension, to lower it. The proposed system is based on DC-auto transformers and active rectifiers working similarly to those in 3-wire AC railway electrification system. Pantograph are using as now a days for the high speed traction system. 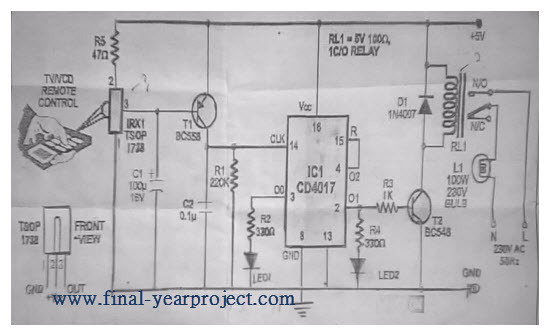 Present project is designed using 8051 microcontroller to avoid railway accidents happening at unattended railway gates, if implemented in spirit. This project utilizes two powerful IR transmitters and two receivers; one pair of transmitter and receiver is fixed at up side and also for the protection features of boggie monitoring system. Use only for your reference and study work.